One of the biggest names in video gaming history has just signed a new deal to develop at least three new games. 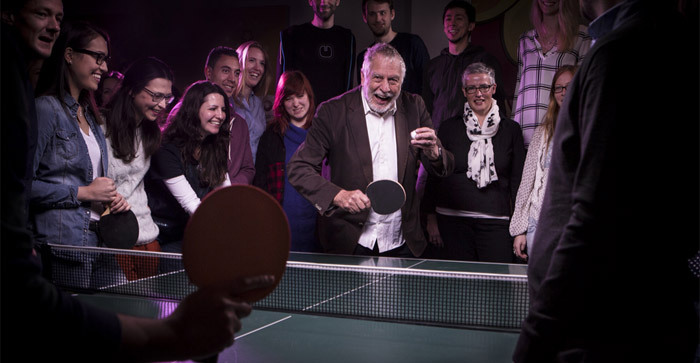 Nolan Bushnell, one of the founders of Atari, and developer of classic iconic titles such as Pong, Breakout and Asteroids, has signed to develop innovative mobile/tablet titles for Netherlands-based Spil Games. To be clear, Bushnell isn't going to be personally coding these modern mobile masterpieces. Develop reports that the 73 year old's purpose will be to provide initial concepts for the team at Spil. While the inked deal is for three such games, Bushnell's enthusiasm spilled over, and he would like to help create five to eight new titles, says the report. "The future of gaming has a very strong mobile component," said Bushnell in a statement. "It's where most people play games and it's where the technology and ideas are developing most quickly." Spil has grabbed an iconic figurehead to push forward its mobile gaming ambitions and it knows it. Spil Games CEO Tung Nguyen-Khac said "The fact that Nolan chooses to work with Spil Games is a huge validation of our approach to mobile gaming." If you've never heard of Spil, the firm apparently has a track record of "working on multi-million dollar franchises," offers a multitude of mobile and web-based games, and boasts over 115 million monthly players of its games. Bushnell isn't looking for the drama of corporate life again, notes CNBC, but is just enjoying this opportunity as a fun challenge. "I had a little bit of time," he said. "A lot of times I make decisions because things just seem right." The Atari founder has been working at Spil on-and-off for six months already, with the first collaborate game release planned for 2017. Mobile games have become a bit of cesspool for companies who hook you into addictive games then charge exuberant amounts of money to excel via coins/gems. Its got so saturated that the monetary system in place is basically just copy/pasted into each game with few changes. Hopefully he can bring something new to the table rather than just more of the same. YOU LOSE! BUY MORE BALLS FOR $1.59 OR WATCH A VIDEO FOR A BIGGER PADDLE? This is what I'm afriad of and exactly what they are likely to do. I think that people these days are'nt intereted in paying for mobile games up front, even though they end up spending more in the long run the market has spoken with games like clash of clans and bejeweled.